A bathtub enclosure generally consists of three walls around the tub, covered in a waterproof material to protect the walls from moisture. Often, the enclosure doesn’t cover all of the walls, but stops partway up and along the sides. In that case, you'll need to put something around the edges, to make the transition between the enclosure and the surrounding wall. One attractive option is trim tile, which comes in all kinds of decorative styles. It looks especially good if the enclosure itself is tiled. Install your regular tiles around the bathtub enclosure. Let them set for a day. Measure the perimeter along one edge of the tiles, using a measuring tape. Mark the middle with a pencil. Spread thinset mortar over the back of a trim tile with a notched trowl. Press the tile in place along the top edge of the tiled area, next to the center mark. Set spacers below the trim tile to space it from the wall tiles. Set more trim tiles along the rest of the span, mortaring and spacing them in the same way. Use a tile cutter to cut the end pieces as needed. Trim out each side of the enclosure in the same way, so trim tiles are all along the border of the regular tiles. Allow the trim tiles to set for a day. Remove the spacers. 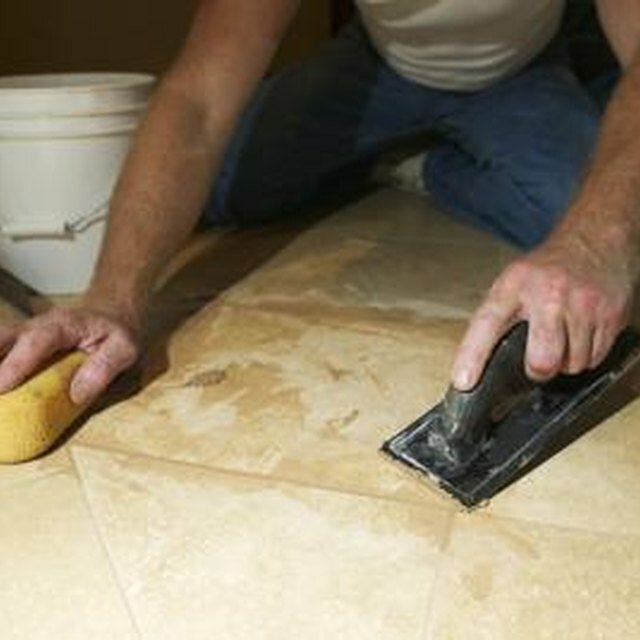 Use a grout trowel to grout the whole enclosure (both the regular and trim tiles), forcing the grout into the spaces between the tiles and wiping down the residual grout with a dampened sponge. Wear eye protection when cutting the tiles.